The Golden Gate Bridge, which celebrates its seventy-fifth anniversary this weekend, was built against great odds. 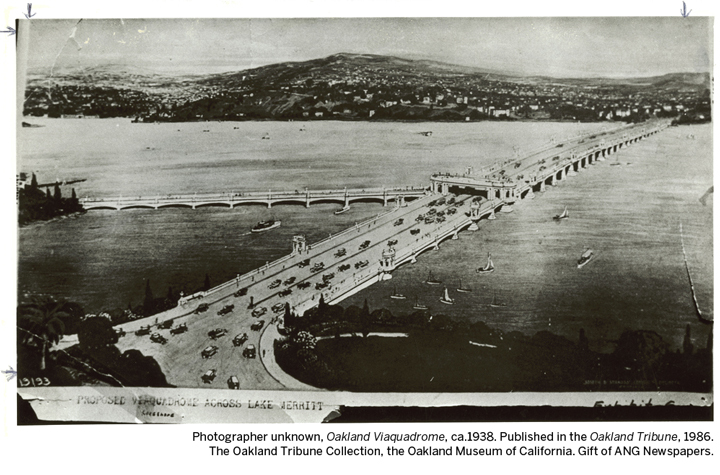 We culled from our collection the relic of a bridge that didn't get built: a four-lane behemoth spanning Oakland's own Lake Merritt. The 1938 proposal was known as the "viaquadrome," or more formally as the Bridge of Great Beauty. Rumor has it that the proposal was developed by Chief Engineer on the Golden Gate, Joseph Strauss. This factoid hasn't been confirmed, but if it's true, it was most certainly the last bridge Strauss envisioned. The Bridge of Great Beauty was proposed the year Strauss died, one year after Golden Gate was completed. It strikes me that this bridge is a wee bit out of proportion to the size of Lake Merritt. Some bridges are built, but some, thankfully, are not.